This map is symmetric, with two identical forts facing each other. 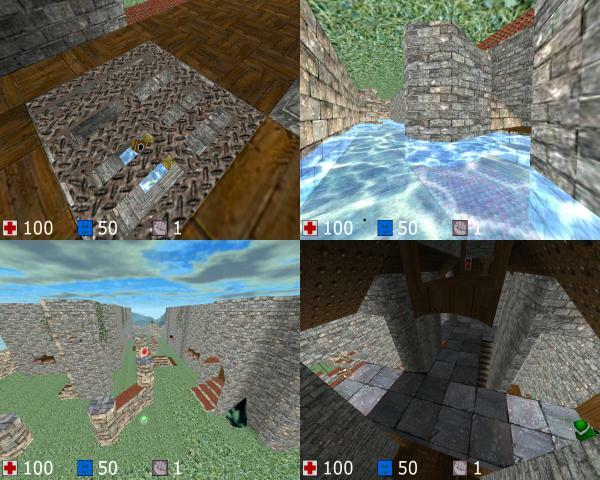 Originally designed as a CTF map, it plays out rather well in FFA and other weapon-ful modes. Not so great for instagib or any of the fist-only modes. Outside the forts there is a large open area punctuated by a chain of platforms leading from the corners to the center, providing access to the yellow armor, healthboost, and quad. Also located outside are two sniper towers accessible via jumppad at their bases, and a wall around the edge of the zone. Visibility ranges from moderate to excellent, including into the first floors of the forts. Ammo and health is generously distributed. Below the map lie sewers. The sewers are accessible via two staircases near the center of the map, and two staircases down from the first floors of the forts. They are also visible through grates in the map corners and above the pits inside the forts. Two playerstart positions are placed in the sewers, as well as health and ammo, with two yellow armor items in the pits under the forts. WQD gets up to 5500 due to very few occluding walls, with an average of around 3500. Also to be noted is WVT from 3500 to 14000 and EVT from 13000 to 100000. A large number of mapmodels on this map, mostly neccessary for architecture, leads to lower than expected FPS. LOD adjustments can help, but not to the same extent as on a cube-only map.